Population: On target. Yemen’s population has increased from 23.6 million to 27.5 million since 2010—an annual growth rate of 2.58 percent. 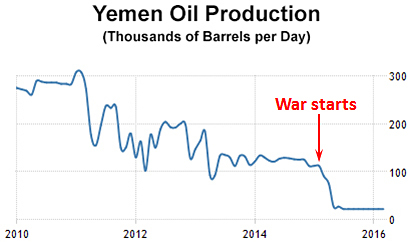 If this continues, Yemen’s population will double by 2037. I remain fairly ignorant about Yemen, aside from the fact that it’s the site of a brutal proxy war between Saudi Arabia and Iran—in Saudi Arabia’s view, .anyway—and we’ve been assisting the Saudis since it started. But Yemen’s future looks pretty bleak no matter who wins. What happens when they finally pump the last of the groundwater and there’s nothing left?